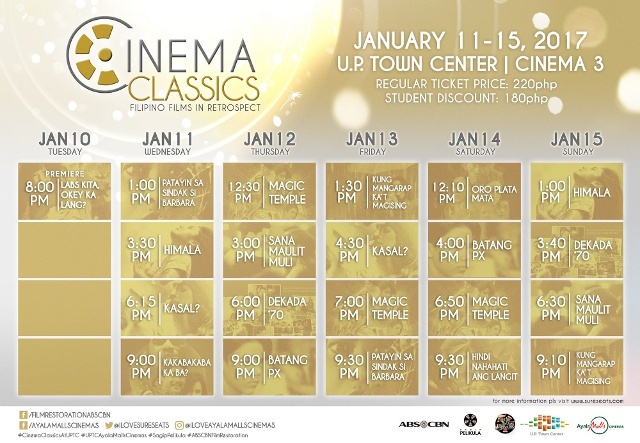 Catch other restored Filipino classic films for just P220! (SPOT.ph) Folks who grew up in the '90s will likely remember this immortal line from Jolina Magdangal: "I'm so stupid to make the biggest mistake of falling in love with my best friend." If you've ever related to the love story of Ned and Bujoy, then it's time to make your way to UP Town Center Cinemas this month. From January 10 to 15, catch the newly restored Labs Kita, Okey Ka Lang alongside other ABS-CBN Film Restoration classics like Sana Maulit Muli, Batang PX, Magic Temple, and Patayin Sa Sindak Si Barbara. For more information, log on to ABS-CBN Film Restoration's Facebook page or call 621-3275 (local 6002 or 6003).